After a six-year hiatus, Nine Inch Nails released With Teeth on May 3th, 2005. It debuted at #1 on the US Billboard 200 chart and has been certified Gold in both the United States and United Kingdom. The year of “Gold Digger”. The year Tom Cruise jumped on Oprah’s couch. The year that Nine Inch Nails released With Teeth, an album that I openly made fun of at the time. I’m not sure if you’ll be able to imagine this, but back in 2005, I was very opinionated and pretentious about the kinds of music that I would admit to liking. I know, right? Crazy. But it’s true! Nine Inch Nails had officially landed in the “uncool” pile, with most of the other alt-rock offerings of the 1990s, so I neglected to give With Teeth any attention upon its release, beyond hearing one single and hating it. Was I, the infallible Mark Meeks, in the wrong on this one? There’s only one way to find out! Trenny’s sounding vulnerable and jealous on With Teeth‘s opener. The track simmers in an underwhelming sort of way, until it shifts gears for its outro and becomes… kind of fun? By the time a bunch of multi-layered “Reznor Soul Singers” are belting it out alongside a snarly over-driven bass guitar riff, I’m finding myself having a much better time than it sounds like the lyricist is. Lighten up, brah! It’s 2005! The noisy, speedy drums that serve as this song’s backbone are great fun, and bring me back to earlier highlights of the NIN catalogue such as “Gave Up“. While the vocal approach on the verse sections seems like it could be a parody of “intense Trent” vocals, the chorus delivers the demented goods, as TrenTren howls like an absolute maniac and the song threatens to melt all around him. This song is actually pretty fun, in a pure teenage aggression sort of way. I mean… the guy was 40 at this point. So… maybe he shouldn’t be this mad anymore. But still pretty fun to listen to. The drum and bass figure that opens this song is very pleasing. It has an aggressive woof to it that manages to feel off-kilter and purposeful at the same time. The songwriting paired with it is half-baked in comparison, particularly the very limp chorus. It’s a familiar sounding format for a refrain, and it has been done to much greater success in earlier songs (“Wish“, for example). Luckily, this tune does not overstay its welcome, clocking in at a brisk three minutes. Good call, Trunt. A four-on-the-floor beat never hurt anybody. This song is catchy as hell. I think that you could actually sing Republica’s “Ready To Go” to along with it. This is not a complaint. The bass instruments and synths sound terrific here, and while I don’t necessarily think that this is the smartest tune that NIN have released, it certainly might be one of the most stupidly fun. Fun Trent Reznor is weird, though. I don’t know how I feel about it. We’re in full-on drunken rant mode on “Love Is Not Enough”, and while I don’t feel that it holds up very well in terms of songwriting, there are some pretty interesting sounds happening here. The cavernous, growling bass guitar and overbearing fuzz-saw guitar work are just fine to listen to, and the song is another short one. Not much to really complain about here. Hooray! It’s the return of the warbly, sad piano from The Downward Spiral. I missed you, buddy. This song sounds great, and not just because I can sing “Blow Up The Outside World” overtop of most of it. The chorus is kind of repetitive, but… that kind of works thematically, huh? I feel as though this is the most classic-sounding NIN song on the album so far, in a mostly good way. Some of the vocal work is a little shaky, but that seems to be what Terrance was going for on this album. I remember when this album was originally released, I heard this song and immediately wrote off the whole album because I hated the way that the words “with teeth” were sung so much. I still do! He sings it like “WITH TEE-THUH”. It is ridiculous and detestable! That is a James Hetfield maneuver and it is the worst! The rest of the song is only so-so. The piano-based bridge is vintage NIN, as is the outro freakout. It is not nearly enough to save the tune from its terrible chorus. This is the album’s first true loser! I had some certainty that Tweety Rezbird was going to hop in onto the beat that “Only” establishes with some of his patented white guy bee-boppin’ spoken word “rappin'”. The backbeat and instrumentals are blandly competent on this track, but the vocals are truly embarrassing. He sort of sounds like he’s having fun, though, so bonus points for that. Because we all deserve to be happy. Although the verses in “Getting Smaller” skate uncomfortably in a dad rock direction, the chorus is huge and fun. I suppose if NIN is going to do big, dumb rock songs that manage to be this fun to listen to, I can deal with the fact that it’s kind of like… the “Takin’ Care of Business” of NIN tunes. Great guitar line in the chorus. Just a monster. Oh, great. He’s writing songs about forgetting his sunglasses at home. I haven’t found much to like about this song, and the falsetto-driven chorus borders on intolerable. So… another strike. Although the slamming bass and terrifically squelchy static effects in “The Line Begins To Blur”, the song is so by-the-numbers Nine Inch Nails, I can’t find much of a reason to recommend it. There are other songs to recommend. This feels like filler to me. You can kind of sing “Ready To Go” to this one, too. This is a Nine Inch Nails sketch song in the grand tradition of “The Day The World Went Away“. It sounds pretty great and builds to an effective climax. Some of the sonic elements actually made me feel dizzy, which is a great accomplishment. For not really being much of a “song”, this song is pretty good! This is the most singer-songwriter Nine Inch Nails have sounded since “Hurt”. While this song doesn’t quite reach the heights of that classic tune, “Right Where It Belongs” is still very nice. The production is just wonky enough to offset the somewhat sentimental vibe of the song and its performance. …it is not the best ending to a Nine Inch Nails record, but it is perhaps the most pleasant? I honestly wasn’t expecting it. It’s nice. This does not look like real hair, but that looks like a really comfortable and functional jacket. 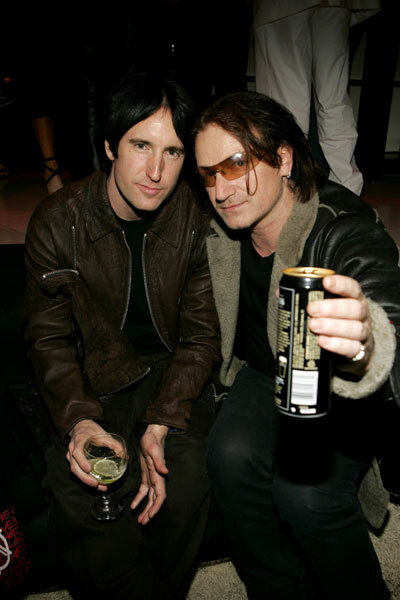 A Bono may be the world’s worst fashion accessory, Trent. All joking aside, Trent’s clothing in this era seems decidedly normal, and – aside from his dramatically floppy hair – it seems as though his appearance has become a non-statement. I’m going to come right out and admit that I’ve been living with an incorrect opinion about this album. It is totally fine and parts of it are actually great. With Teeth sands down many of the abrasive edges of the Nine Inch Nails formula, and seems to attempt to inject a greater sense of fun into many of its tracks. It isn’t universally successful, but it is far more successful than I had anticipated. The album does fall short in a number of ways. It feels frivolous in a way that Nine Inch Nails albums, successful or not, have never felt to me. There’s something lacking in terms of depth that goes beyond lyrics (which are touch-and-go, even on the best NIN albums). The album is fun in many spots and shines in other ways, but it feels somehow insubstantial. Additionally, I think that some of the vocal work on the album could have been more polished and I’m slightly disappointed that there aren’t any great instrumental tracks to speak of (especially following an album as instrumentally strong as The Fragile). That being said, there are tracks on With Teeth that I will return to. Because they are fun and I can sing “Ready To Go” while listening to them.